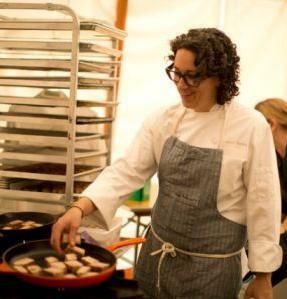 This week on The Line, host Eli Sussman sits down with Chef Hillary Sterling. Born and raised in Sheepshead Bay, Brooklyn, Sterling was inspired to cook by her grandmother, who had a passion for cooking and a knack for resourcefully combining ingredients. Years later, after earning a business degree from Indiana University, Sterling began taking night classes at a local cooking school in Bloomington, which promptly refocused her attention on food. After graduating from Le Cordon Bleu in Chicago in 2003, Sterling returned to New York City and worked in restaurants owned by Bobby Flay, Mario Batali, Missy Robbins, and more. Currently, she is the chef at Vic’s, a new neighborhood Italian-Mediterranean restaurant in NoHo.